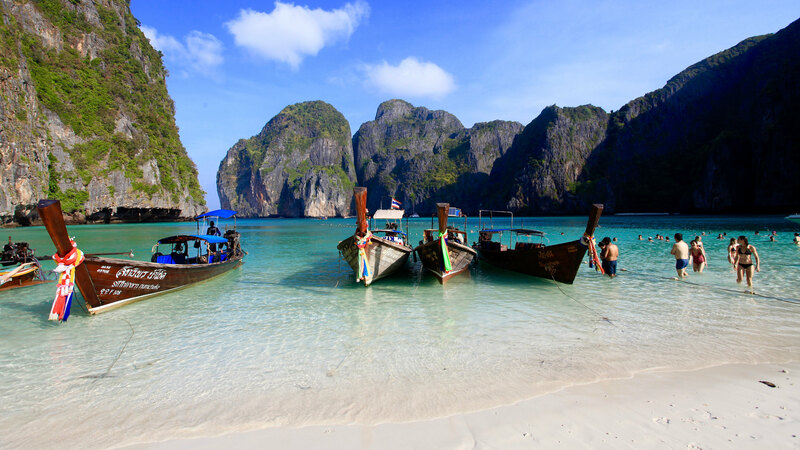 The Andaman coast of Thailand has amazing beaches – Maya Bay, undoubtedly best dives of the region -Similan and landscape straight from scenes of Avatar – Krabi. 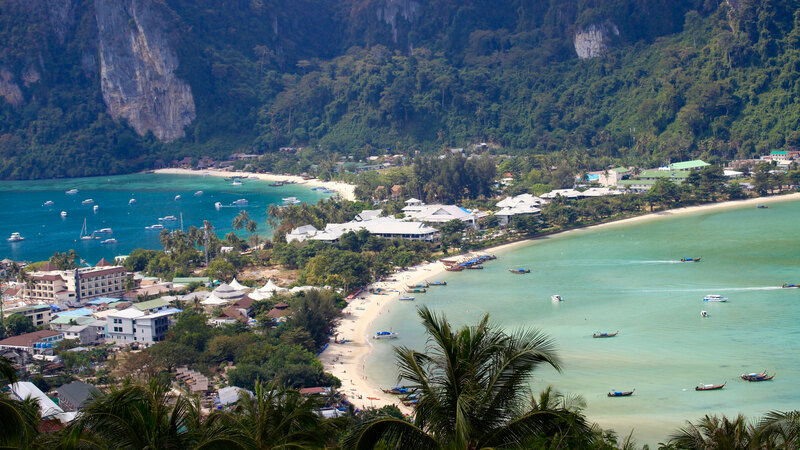 A visit to amazing Phi Phi and Railay is a must in Thailand. February 2013: winter is still lingering around in Delhi. Suddenly one mail pops up in the inbox. Cheap flights on offer from Air Asia with low fares never seen before. 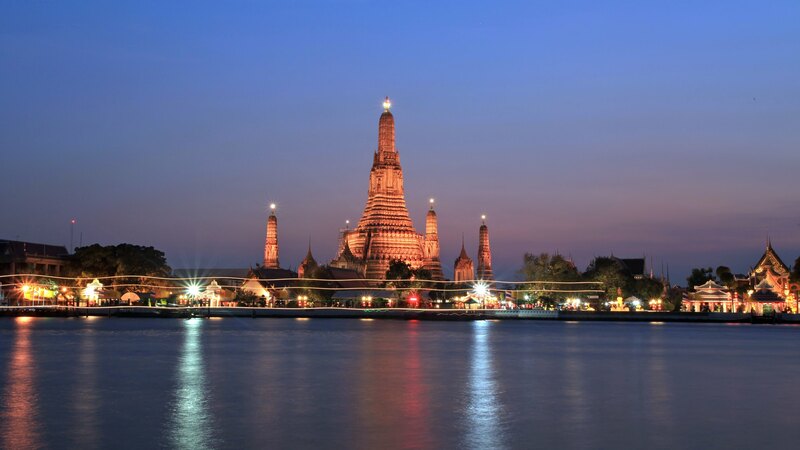 A return trip to Bangkok only for Five Grand is simply irresistible. We booked a return trip to Bangkok from Kolkata for a 2 week trip to South Asia with no idea of where to go. Nothing happens for the next eight months. Early November 2013: One fine sunny morning suddenly one mail pops up in the mailbox. Air Asia regrets to inform that the flights from Kolkata to Bangkok will not operate from 1st March, 2014. Asia is offering full refund or a free of cost change to any date. So I called up Air Asia helpline and asked them to propane the trip to 2nd week of January. So after all this the two week trip becomes a modest 1 week trip and now not South Asia but only Thailand. 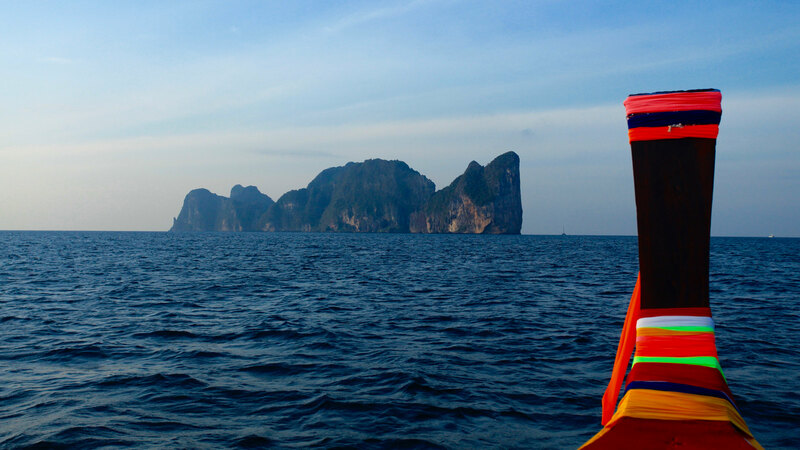 Late November 2013: After lots of trip planning for the 7 days in Thailand we are still un decided whether to visit the Gulf of Thailand or Andaman Coast. 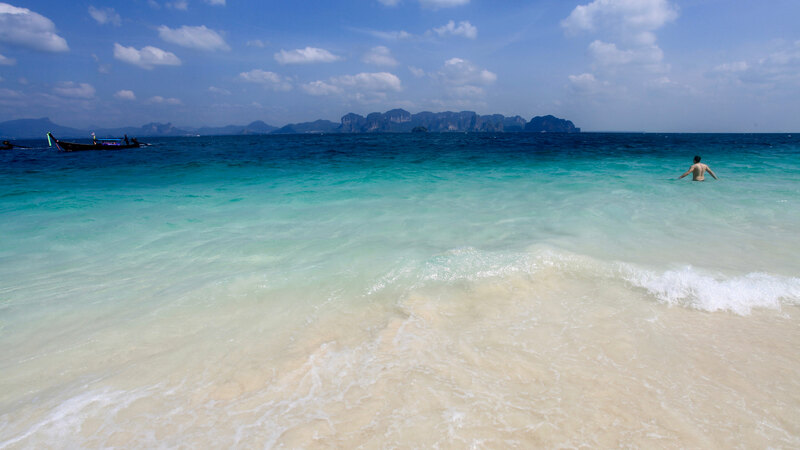 One option is the luxury of Koh Samui with Koh Tao and few days in Krabi. 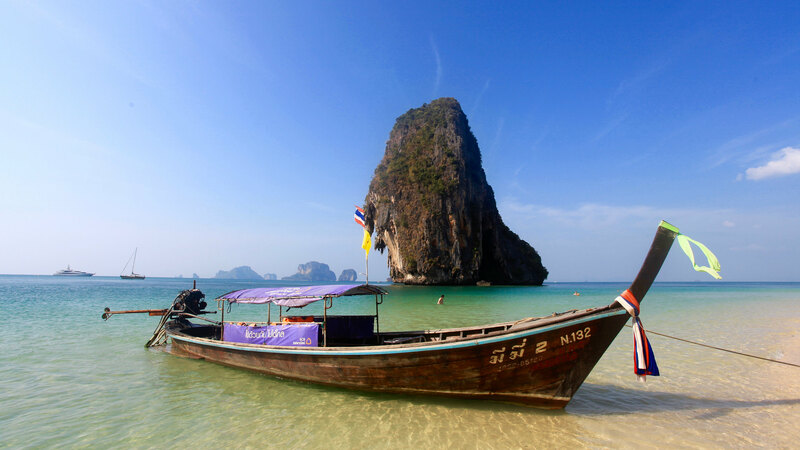 Other option is to visit Phuket, Phi Phi and Krabi. 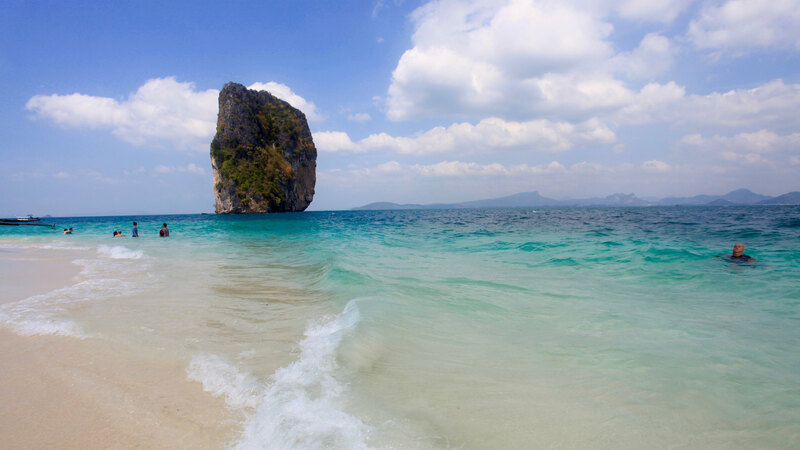 And last is to set foot on both Phuket and Koh Samui (yes this is possible). We booked our first hotel at Koh Samui. Then after a week ended up canceling it free of cost. So finally the plan is here. Visit Phi Phi for 3 days, Krabi for 2 Days and final 2 days in Bangkok. All bookings are done from booking.com. We found this site very informative, well designed and with most options. Our plan was to book the hotels at the beach and not far from the action. Other sites specially the sites designed for Indian customers like makemytrip, yatra, and cleartrip failed miserably to provide options and variety of the global counterparts like booking.com, expedia and hotels.com. The map in booking.com is quite accurate which makes finding hotel very easy. One interesting thing about Thailand is that most hotels are pay at property. We just need a credit card to hold the room. By end of November we are done with all hotel bookings. 12th January 2014: Immigration done and waiting to board the plane to Thailand. 13th January 2014: Air Asia leaves Kolkata at 00:15 AM sharp and soon we are all sleeping. After 2 hrs we woke up courtesy the Air Hostess who informed that we are about to land in Bangkok. We reached Bangkok Don Muang Airport at 5:30 AM (local time). The VISA on arrival is pretty easy and took approximately 30 minutes to get VISA, checked luggage and re checkin for the onward flight to Phuket. Don Muang is a relatively small airport compared to New Delhi (similar to mumbai or kolkata airport). While booking our flight to Phuket we kept a layover of 3 hours to avoid any hurry. Now sitting at the airport we wished we had taken the earlier flight to Phuket. Nothing interesting happened for the next few hours and we reached Phuket at 10 AM. The flight takes only an hour from Bangkok to Phuket. With almost all tourist of our flight heading for the big island, i found only few heading to Phi Phi directly. We booked our ferry ticket to Phi Phi from the airport for 500 Bhat per person. 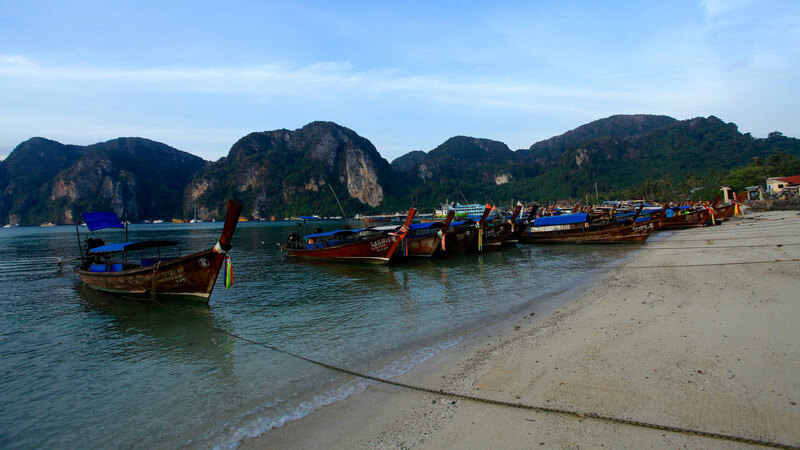 Taxis are available from airport to Rasada pier for ferry to Phi Phi island, @ 500Bhat. But we decided to go ourself and took a local bus from airport to Phuket Town and then a taxi. It is not easy to hire a taxi from the town and they can charge exorbitant price. We waited for 30 minutes for a taxi and then finally reached the pier on time. The ferry started at 1:30 PM. The ferry is huge. 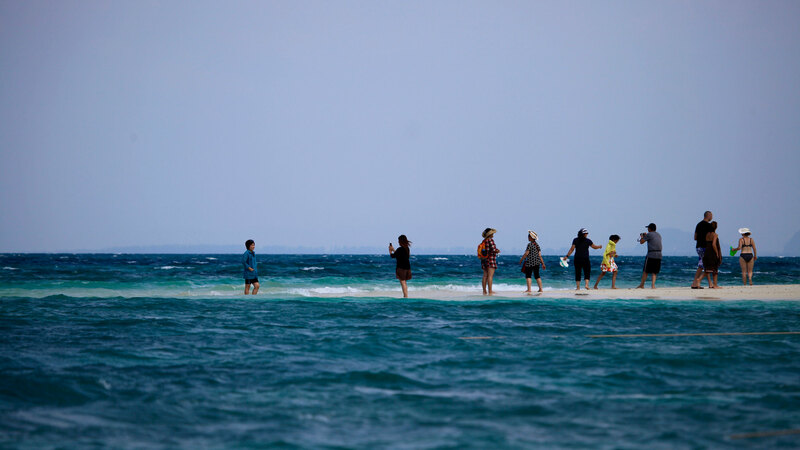 Soon we left the pier and we can see the torquiest waters of Andaman. 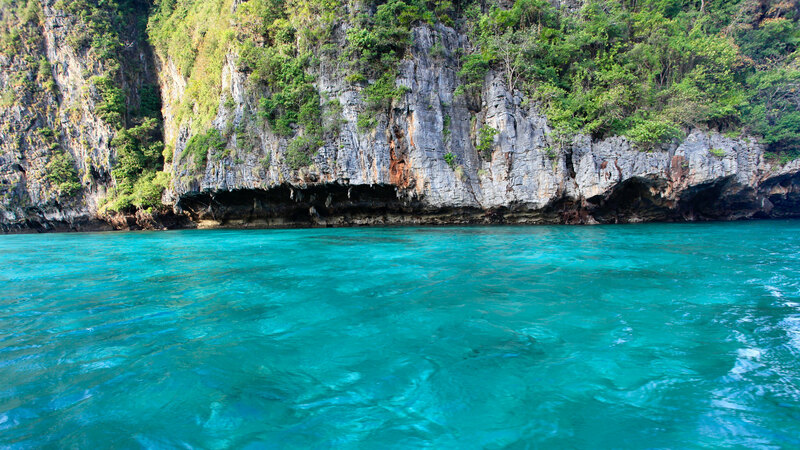 Lots of small islands, rather we should say limestone cliffs are around the large island of Phuket. 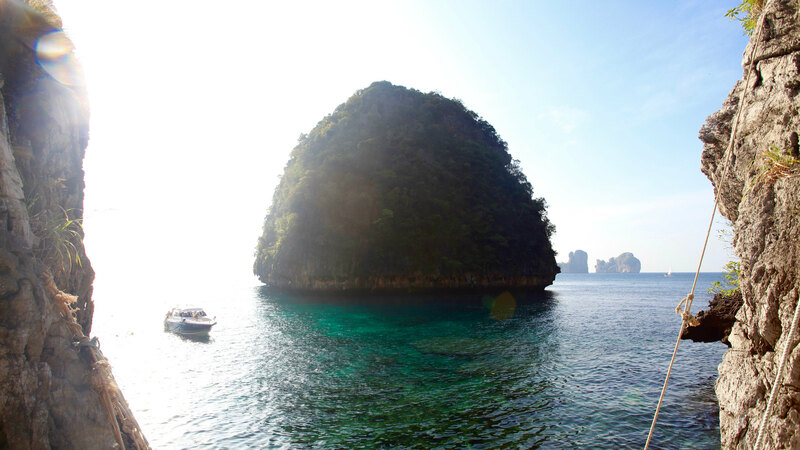 These islands are surrounded by clear blue green waters and we just cannot move our eyes. So the big waves started hitting and we were sleeping again. After almost 2 hrs sleep in the boat, we heard people saying Phi Phi. Yes we can see Phi Phi at a distance. Not to miss the first sight we went out to get the good pictures of the famous island. 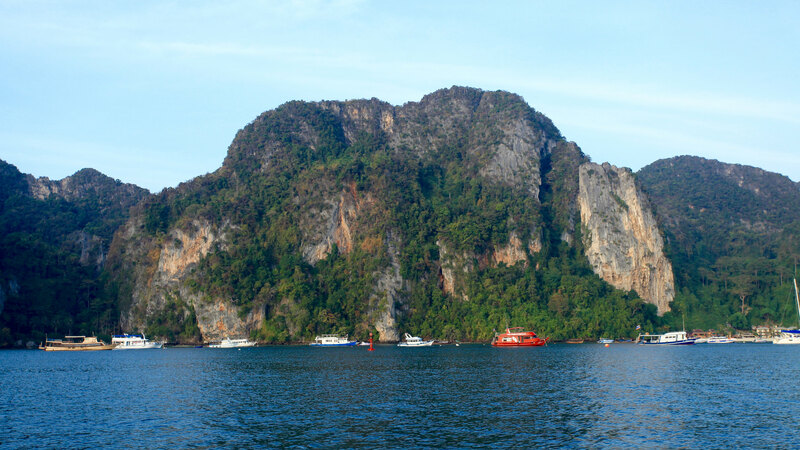 The large cliffs of Phi Phi as we arrive at the dock. We reached Phi Phi pier at around 4pm where the hotel representative was waiting for us. The guy helped us with our luggage to the hotel and it was quite a long walk (only for the first time; actually the walk is not that long). We had booked Ibiza hotel which was stones throw away from the beach. By the time we got refreshed and had our food, sun was already set and the fire shows have begun in the beach. We spent some romantic time sitting by the beach and enjoyed cocktail. Then we had a seafood dinner at the beach and decided to go for a walk in the market.We booked a long tail boat trip to Phi Phi Leh island from the market. 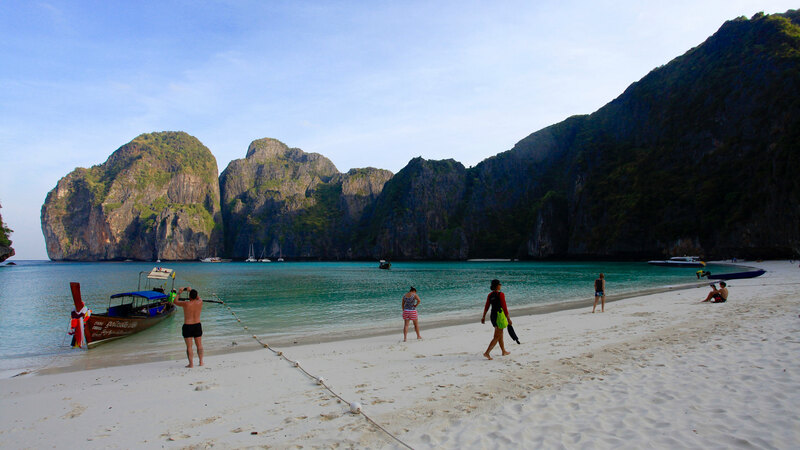 We wanted to avoid the crowd at Maya Bay and so decided to reach early there by 7:30 AM. So we decided we will start early and since no group departure boat trip starts before 8:30am, we hired a single longtail. 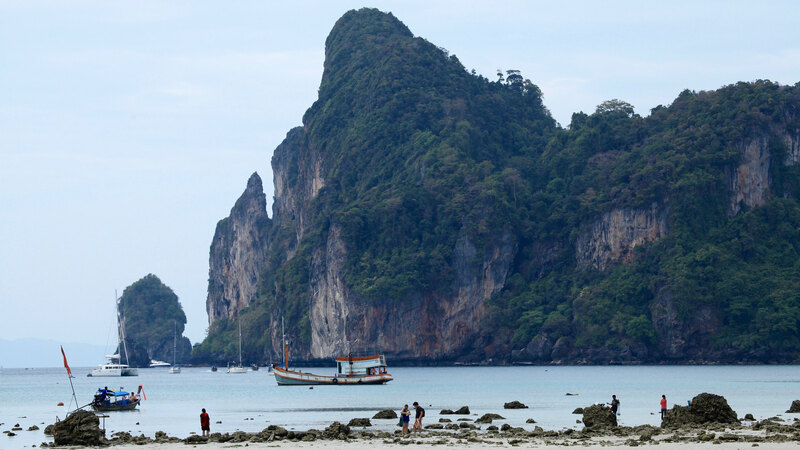 ​14th January 2014: Today is for Maya Bay at Phi Phi Leh. 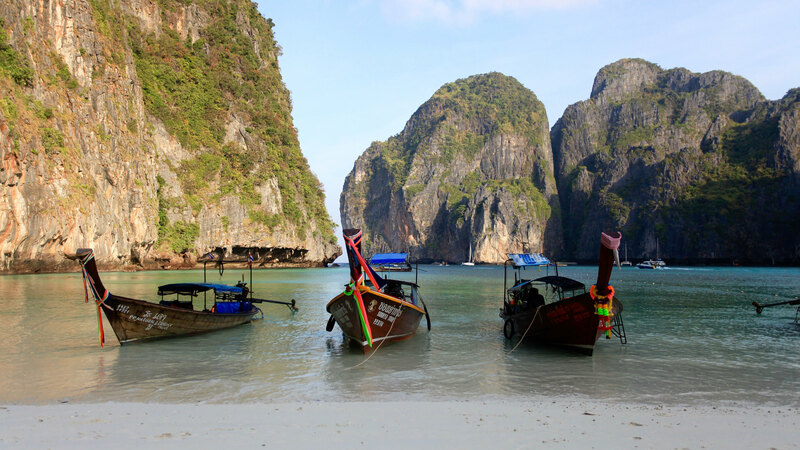 Our Longtail boat started from the Phi Phi Don at 7 AM and we hit the white sands of Maya Bay in Phi Phi Leh at 7:30 AM. We found night campers and few early tourists there. 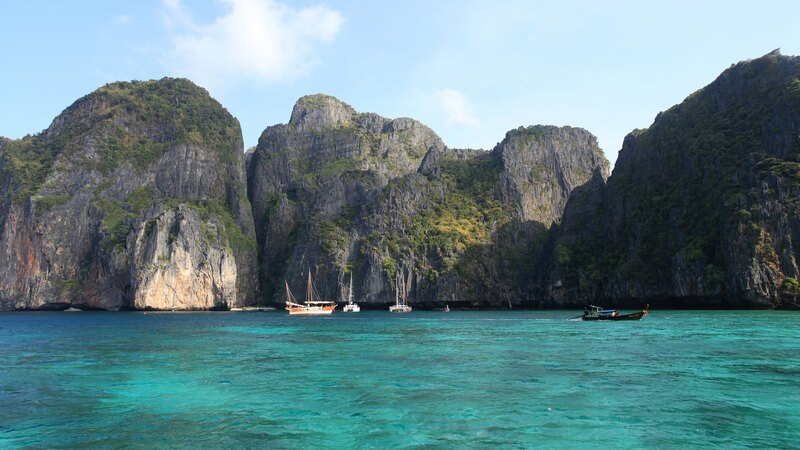 The beauty of Maya Bay is just mesmerizing with the emerald green water and white sand. The water color gets more and more beautiful with sunlight brightening the water. And then by 9 AM the island was brimming with sunlight and all corners are full with tourists. This place is so beautiful you will never feel like leaving but we had other places to visit, so we went off. Just opposite to Maya Bay on east side is Loh Sama Bay which is a very quiet beach. After clicking a few pics here, we moved on. 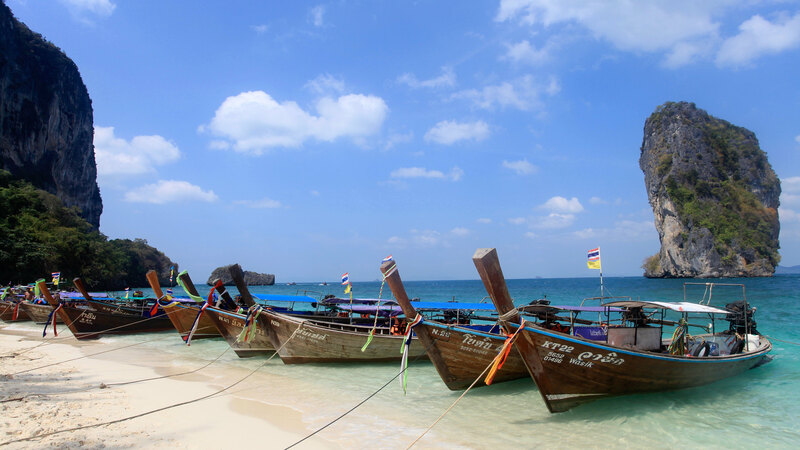 The long tail boats line up the shores and we will ride one to Maya Bay. 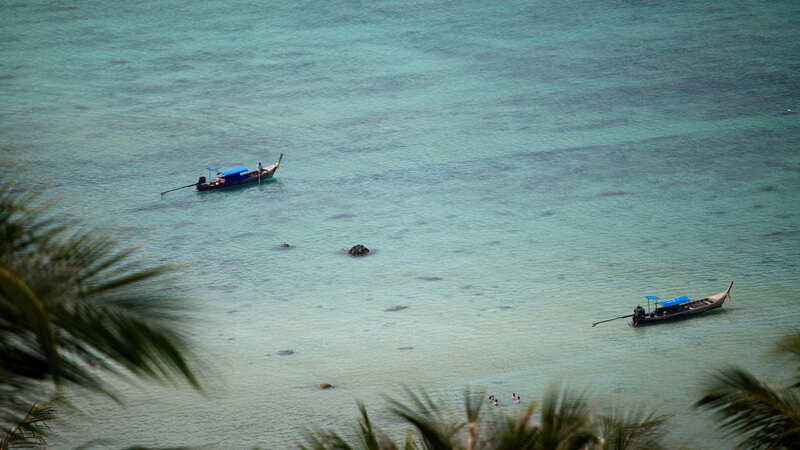 The beautiful colors of Long Tail Boat and Phi Phi Don in the horizon. 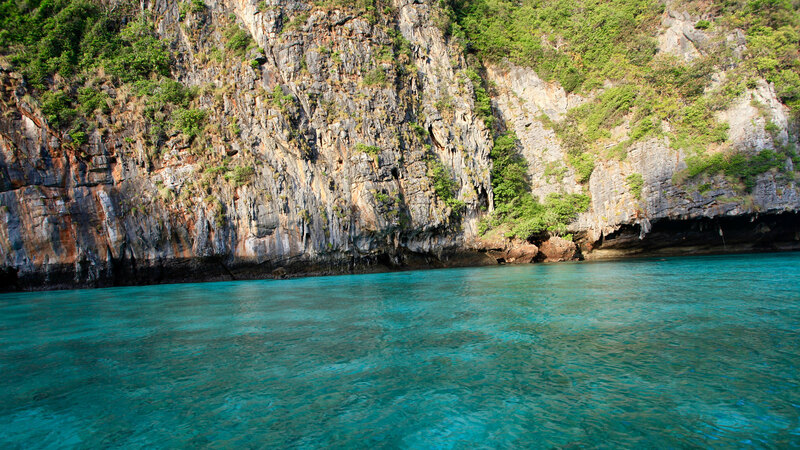 The clean waters of Maya Bay. The east side of Phi Phi Don. Till date one of the most beautiful place on Earth for us. But just after crossing Loh Sama Bay the water was so turbulent due to winds, huge waves started striking the boat and three of us were extremely scared. The boat seemed to topple any time. Ishaan started crying at the top of voice and I was shouting like anything. We told our boat rider to take us back to the pier. We decided to end the boat ride due to extremely choppy waters. We reached Phi Phi Don at 11 AM. Back to Phi Phi Leh. After having breakfast we started hiking for the Phi Phi View Point. It was a steep one hour walk to the top of the mountain. 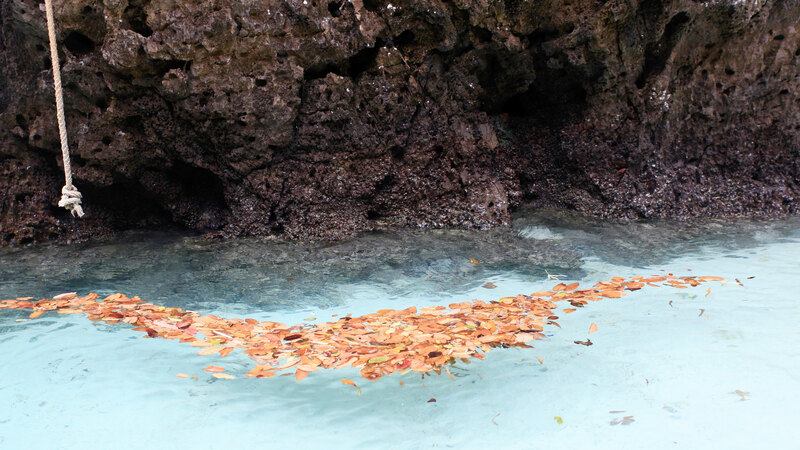 The hike gifts you with some awesome views of the island and the excellent colors of the sea. We kept on clicking pictures from the top. 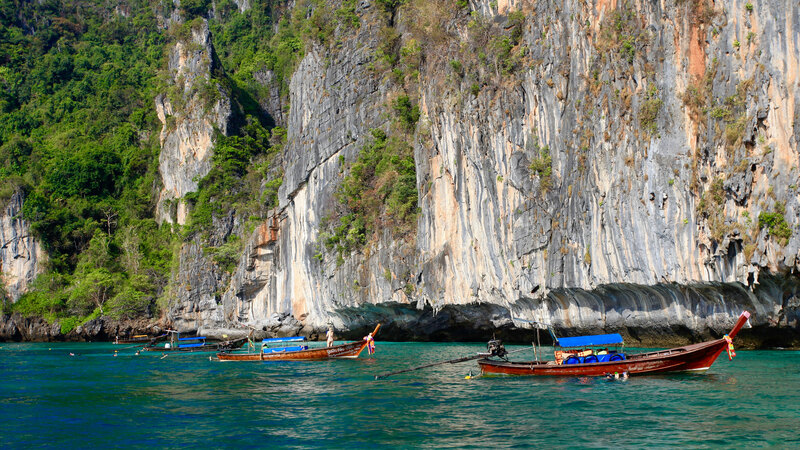 The views extend beyond the Phi Phi Leh and the numerous boats plying between the islands. The walk down takes approximately 20 minutes and we decided to have lunch while coming down at a restaurant which commands awesome views. 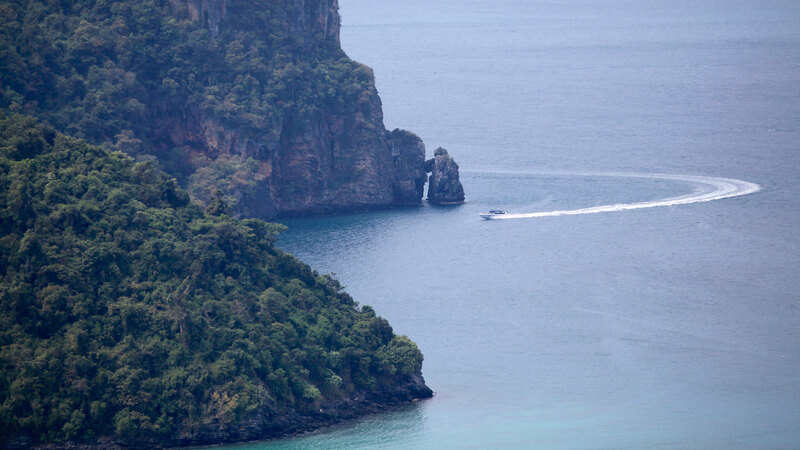 We hiked to the Phi Phi view point and what a view it was. 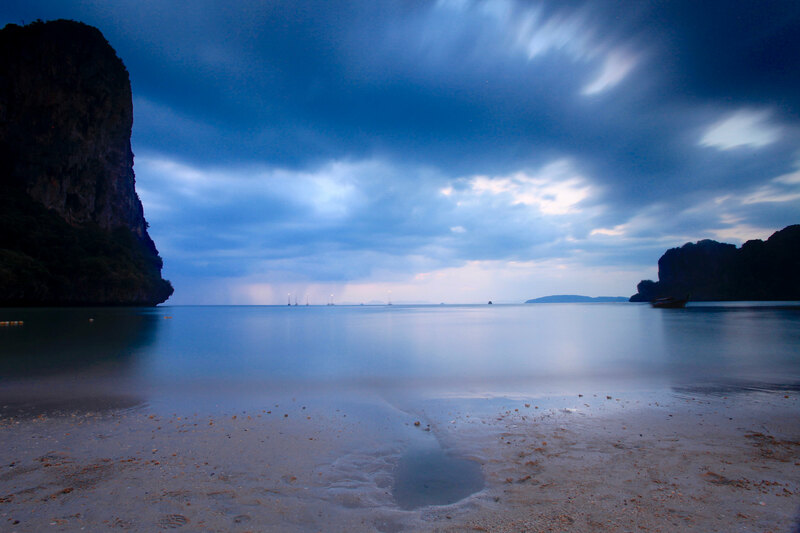 The small streak of land makes the most famous destination of Thailand. We hit the beach again at 2 PM and stayed there till sunset. The lights changed with fireworks and neon lights and music all around. 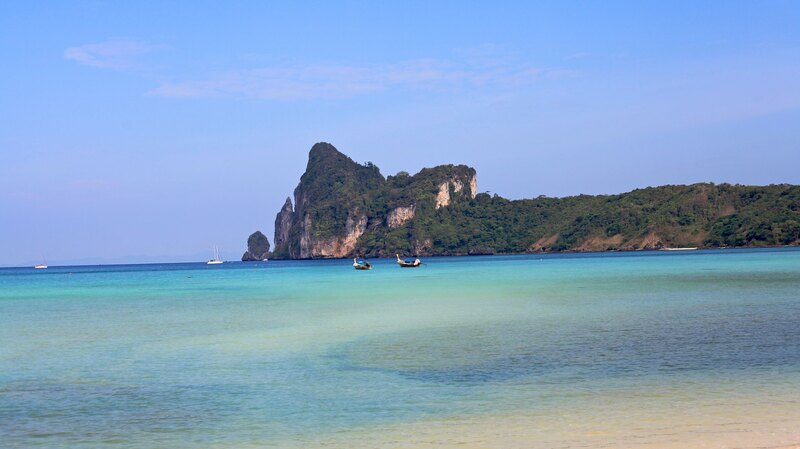 ​15th January 2014: Today we head for Railay. We decide to checkout at 10 AM and we hit the beach while our luggage was at the hotel. We dropped the idea to go to the other nearby beach since the only option available to those parts was by long tail boat and we didn’t want to go for it at any cost after the horrible experience with Ishaan. 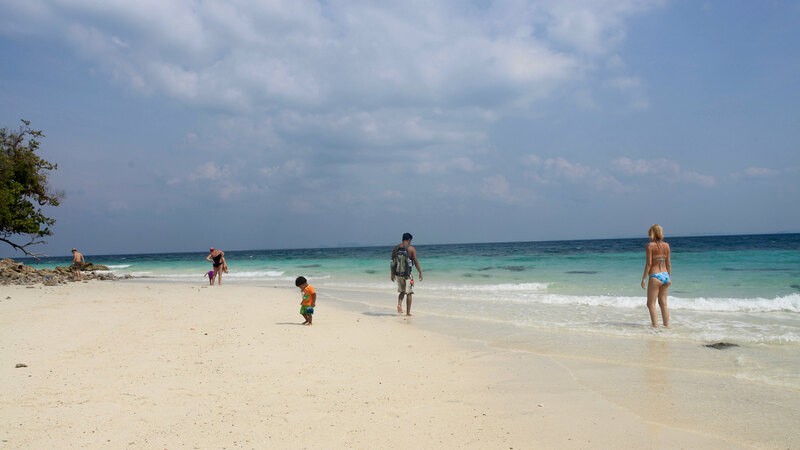 We rented a shack and hit the waters while Ishaan enjoyed playing in the sand. The coconut water refreshed us while we enjoyed the awesome natural surroundings. After soaking the sun and snorkeling in the area we decided to head for the hotel at 1 PM. 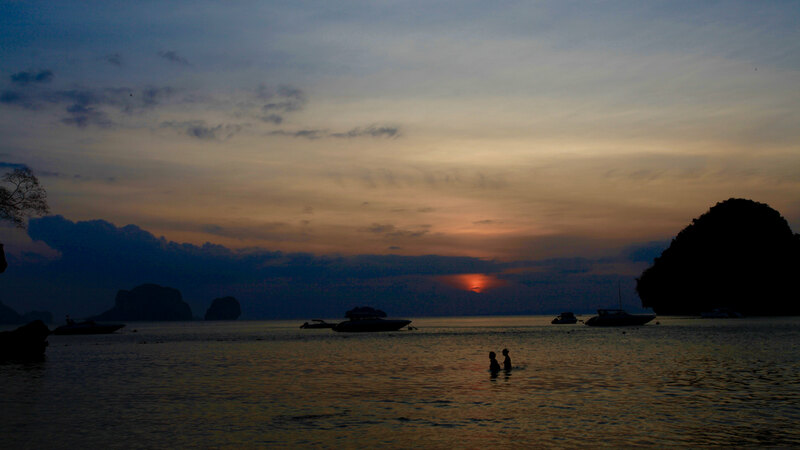 Then we went to the pier for the boat to Railay at3:30. Suddenly the sky was overcast with dark clouds all around. We can see the viewpoint in the shades from the pier. But an amazing thing happened. The sun hit the shallow waters only on a patch and it looked magical. But the magic was a guest for few moments and we were lucky to capture in the camera. 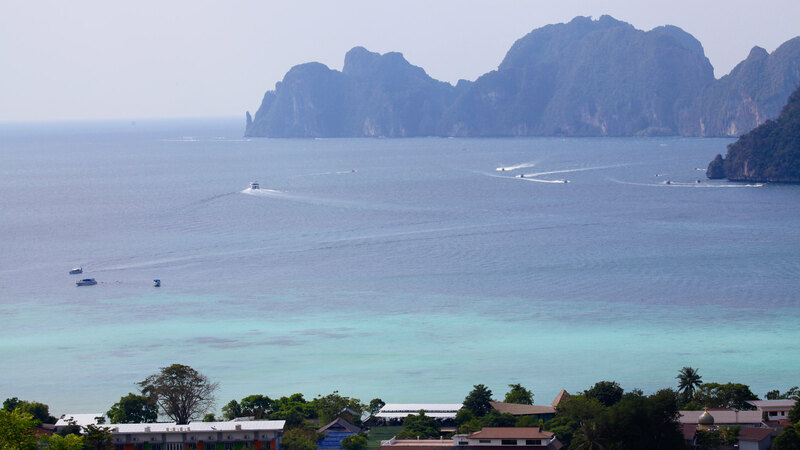 ​The ferry from the Phi Phi Pier set sail at 3:30 PM. The ferry boats plying in the region are quite comfortable with cooled cabins. We slept for most part of the ferry and after almost 90 minutes we reached Railay. Railay West Beach doesn’t have a pier of its own. The ferry cannot go till the beach and the passengers are transferred to long tail boats near the beach. 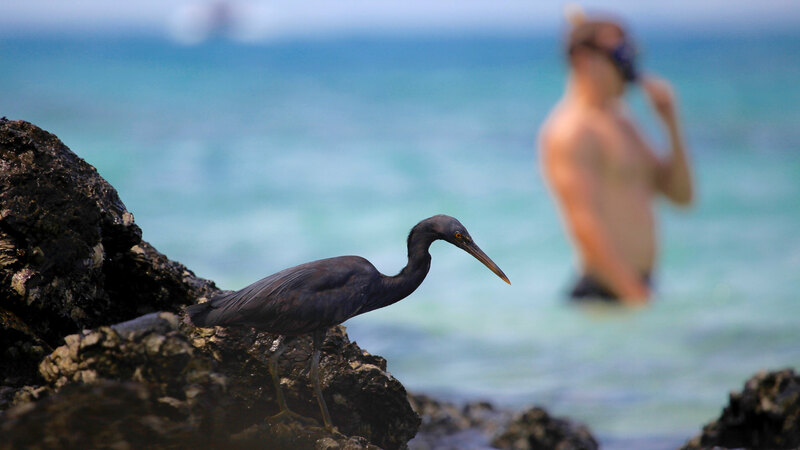 The long tail takes passengers to respective beaches. We had our booking at Railay Princess Resort and Spa. The resort is located on the East Beach and we landed on West Beach. So we had to walk to the hotel after finding its location. The hotel is beautiful and located on the beach, but remember the East Beach is more like backwaters and mangrove. With the welcome kit we got refreshed, checked in and again hit the beach having some snacks by the beach side restaurant in the West Beach. The stay at the hotel was very comfortable and the representatives booked our next day island trip at a 200 Bhat discount per head. 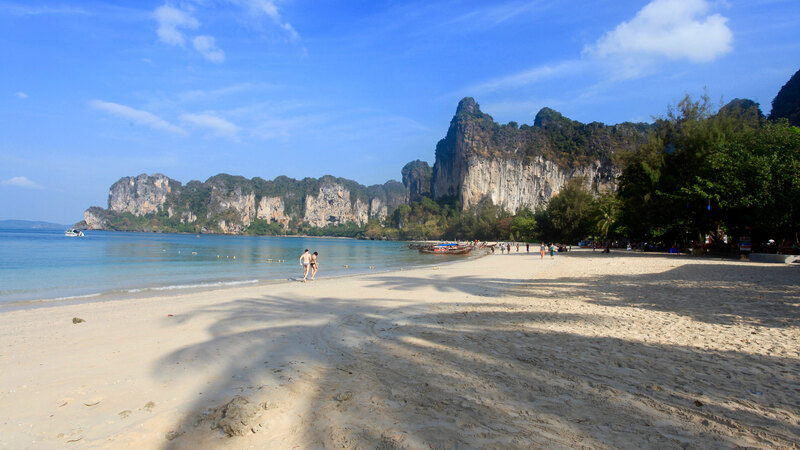 All the resorts on the Railay beach are good and serve delicious thai food. With the sun setting behind the clouds and far off limestone cliffs we decided to have some sunset pictures in this picturesque location. Then we went of to the cosy rooms of the hotel. Beautiful west beach and evening clouds. 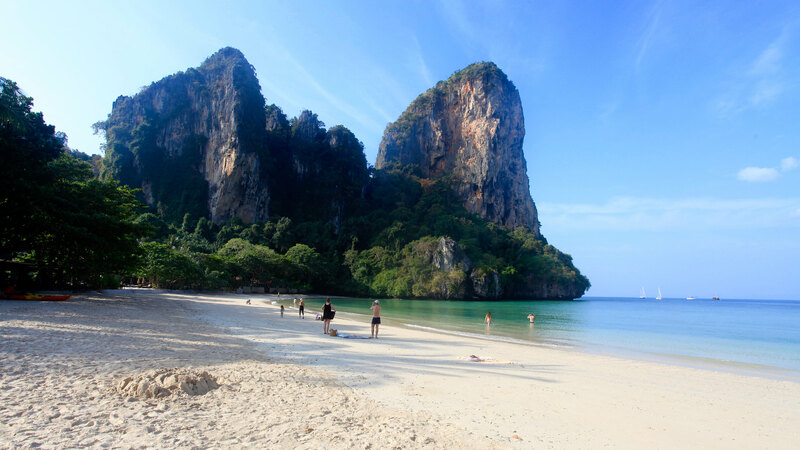 16th January 2014: Today is the time for exploration of the awesome small islands of Krabi. 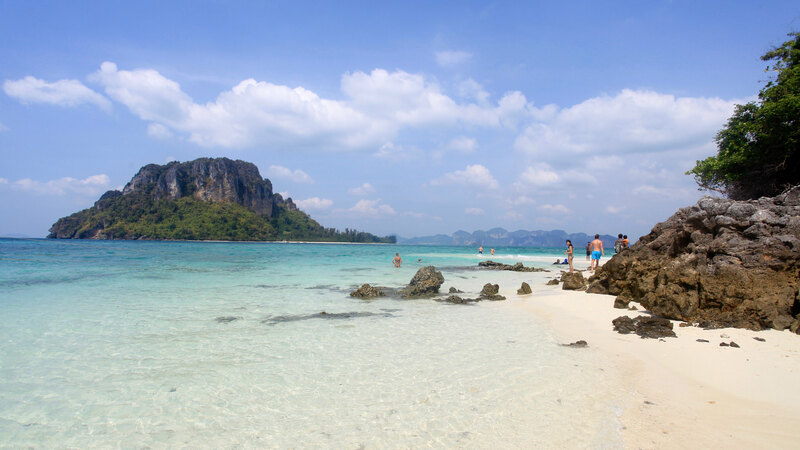 The trip known as 4 island trip is a half day tour and all these trips start from Aao Nang. The speed boat picked us up from West Beach at 9:30 AM. Ishaan is happy to get a Speed Boat as he is very scared of the long tail boats after the Phi Phi experience. 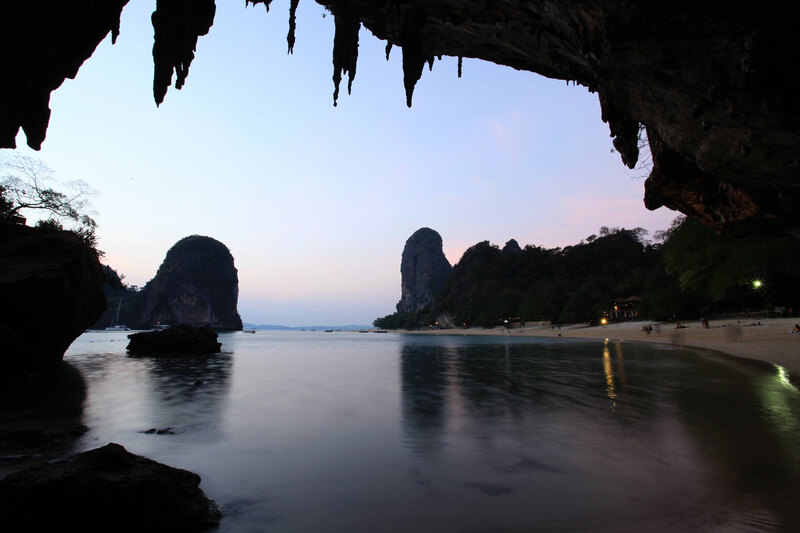 First stop was to the Phra Nang Beach and Phra Nang Cave. It took only 5 minutes to reach the beach. 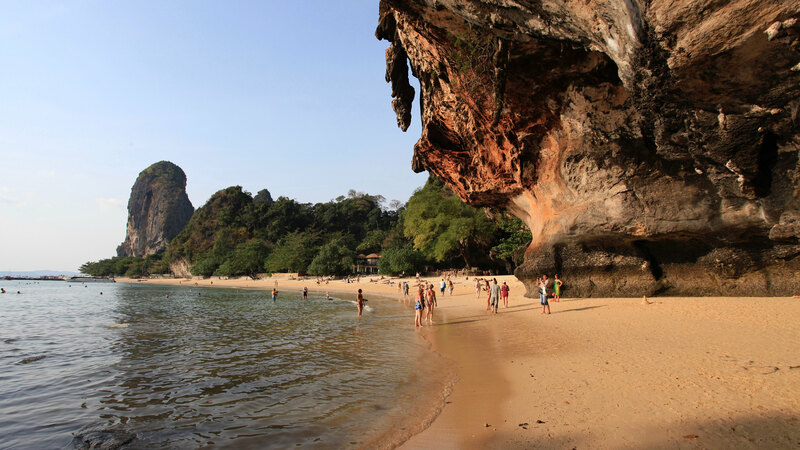 Actually this is part of Krabi and can be reached by walking from our hotel in East Beach. We got down the boat and the first word which came out was “WOW” !!! The color of the water and the sandstone cliff together make it a delight. The number of photos clicked never seemed to be inadequate. The long tail boats with the water at background is a beautiful scene. The only hotel on this beach is Rayavadee which is a very pricy resort. After staying on the beach for about half hour we departed for the next destination Poda Island. On the way we took a round trip around the Chicken Island. This island gets it name from the peculiar rock formation which looks like a chicken neck. At the west side of the island we stopped for an hour to snorkel in the shallow waters full with tiger fish. There were live corals all around and the marine life was brilliant. After this we went to the Poda Island which is again a beautiful one. The color of water was at its best here with the sun shinning bright above us. We enjoyed Thai Rice and Chicken Curry here on the beautiful setting and then dipped ourselves on the simmering waters of Andaman. The rock formation off the beach made perfect setting for pictures. Krabi and mainland can bee seen at a distance and the overall setting was magical. From Poda Island we went to Tup Island the last point of our trip. We reached Tup Island at 1 PM. It is actually two small islands connected by a sand bar during low tide. These two small islands are north of Chicken Island and it is possible to walk to Chicken Island from these islands. We climbed on the cliff to get a birds eye view of the awesome sand bar connecting the islands. We left for Krabi at 1:30 and reached the hotel at 2 PM. 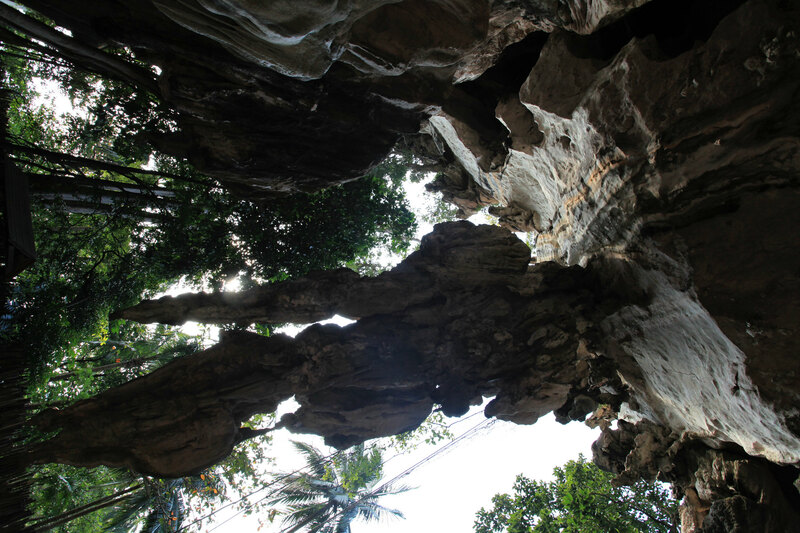 After having some snacks at the hotel restaurant we decided to walk to Krabi ViewPoint and the Phrananang Cave and Beach. The walk tools 20 minutes along the beach and then we reached the beach. But something happened between. 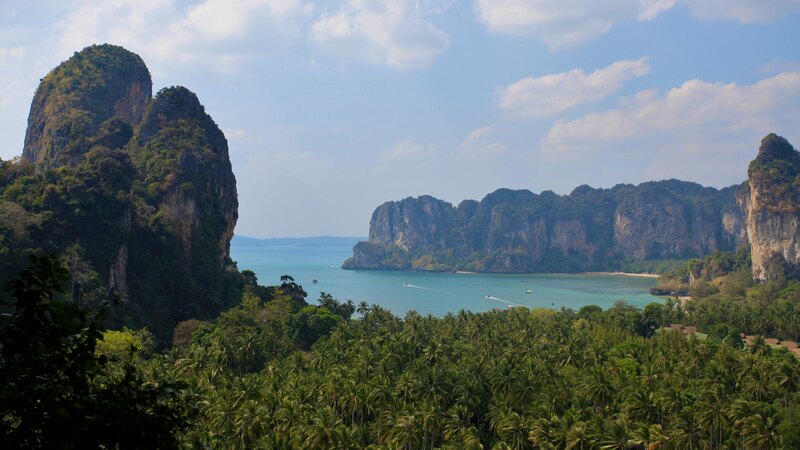 The Krabi viewpoint gives a stunning view of the whole island. The viewpoint is a vertical (almost 90 degrees) climb on the rock. There is a rope all along the track and its scary. We decided to skip the view point because its not possible to climb with a 3 year old boy. This will be for next day. Then on the beach things are pretty cool and beautiful. The setting looks different from what we saw in the morning. The tide is low and now we can walk to the cave easily. The rock formation is spectacular and we decided to wait for the sunset here. We sat and relaxed and enjoyed the last sunset on the beach for the trip. 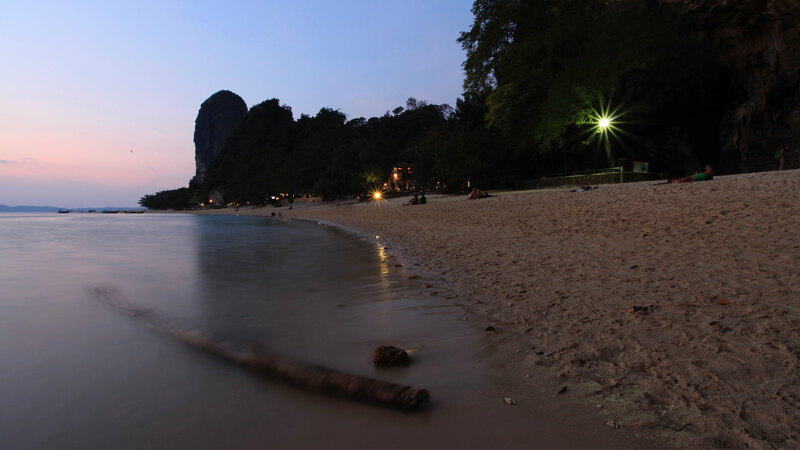 Enjoying evening at Phranang Cave Beach. At the hotel the setting for a perfect for thai dinner and we decided to have pad thai which is thai fired rice. We enjoyed the dinner while we saw the water rising and hitting the walkway. Its already high tide and we strolled the walkway after dinner. We reached the market across the walkway and bought tickets to airport which includes a long tail to Krabi mainland and then a taxi to airport. Boat leaves every hour from the East beach. A trip to Airport take 300 Bhat per person and this includes boat + taxi. 17th January 2014: Woke up early and we enjoyed the fantastic buffet breakfast at the hotel. 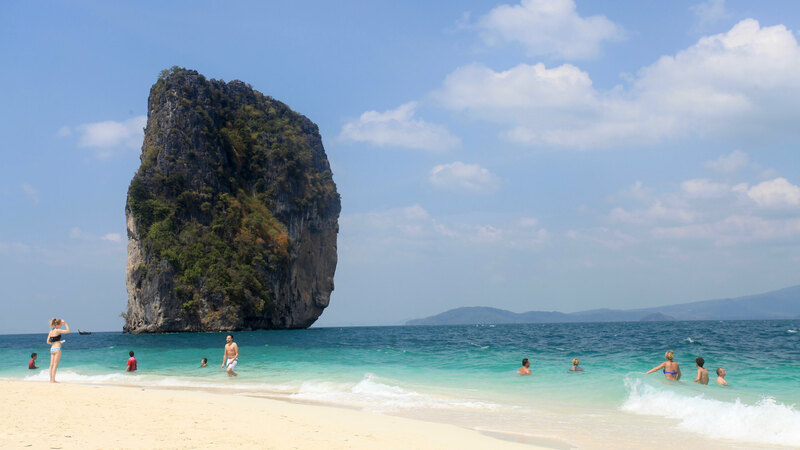 The we walked to the Phra Nang beach and spent the whole morning soaking sun. Today was the last day at beach and we felt bad that we have to leave behind the turquoise blue waters. With decided to have lunch at the hotel at around 12 noon and so we started walking toward it. We had already checked out of the hotel and our luggage was kept at the reception. After lunch I relaxed with a Thai message at the walking street near Railay East beach as Partha went off to climb the trail to the Railay View Point. After about an hour we met again and we went to the hotel rooftop infinity pool. The water was simmering with the towering cliffs on both sides and the coconut trees in the backdrop. We refreshed for an hour in the pool and sipped some drinks. Then we moved our luggage to the long tail boat and headed for the airport at mourned 4:30 PM. Due to low tide the long tail boat was approximately a 10 minutes walk from the hotel. We reached the airport on time and checked in. Time to head to the busting city of Bangkok for the last leg of the trip. The flight from Krabi to Bangkok took an hour. Getting a taxi from the airport was hassle free and we breezed through the tollways of Bangkok to the city centre in an hour. The hotel is located in the central district and there was people waiting to welcome us. Since it was late night, the restaurant was closed. The person at the reception ordered a pizza for us over the phone and while we got refreshed in the room, the hot pizza was delivered at the doorstep. 18th January 2014: We were residing in central Bangkok so all the attractions of Bangkok were in walking distance from the hotel. After having our buffet breakfast we started with our temple visit tour. The temple was just opposite to the hotel, so we started with it. There was complete silence inside the temple and monks were meditating. Partha and Ishaan decided not to enter the temple, because they feared the monks beating up like Hangover II if Ishaan started shouting. After this we decided to walk to the Grand Palace. Bangkok is hot and humid even in January. The walk was not long but the humidity was killing. We already had our dress code confirmed from hotel so did not face any trouble entering the temple. The temple follows strict dress code and unless you are properly dressed, you are not allowed inside the temple. The entry fee to the palace is 500 Bhat per person. There was free English speaking available at 10:30 AM. We waited for 20 minutes and then began our tour. The temple is beautiful indeed and is humongous. The emerald Budhha is situated herein and you are not allowed to take a picture once inside the main temple. 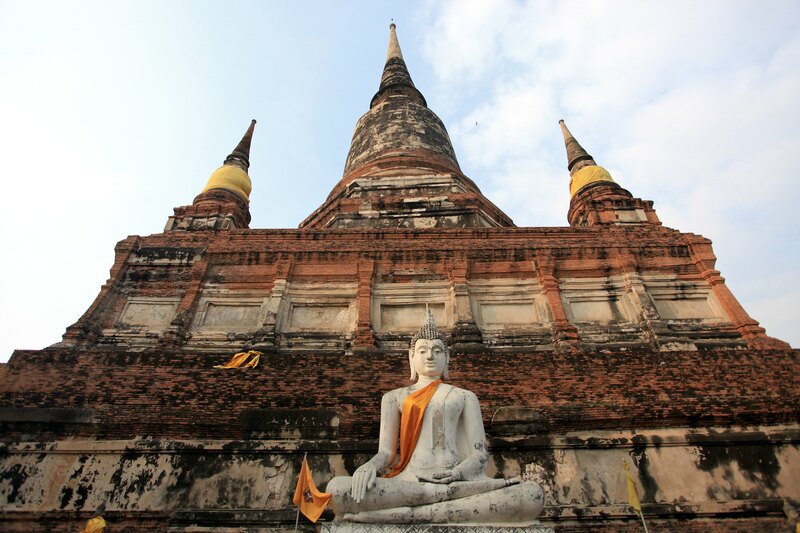 From the Grand Palace we headed towards the Wat Pho which has the largest reclining Buddha of the world. This temple is also beautiful and known for original Thai Massage. After exploring around for half an hour we decided to end out trip for the morning. Once we reached hotel we fell asleep with extreme tiredness. After a refreshing sleep in the afternoon, we went for an evening visit to the Wat Arun Temple. We went to the river side restaurant “Eat Sight Story” where we clicked the night view of the temple. Cruises were passing by the temple and we enjoyed our dinner with the beautiful view. From Wat Arun we took Tuk Tuk taxi to the flower market. We strolled through the market and then hired taxi to Khao San street for dinner and some street shopping. Khao San Street is famous with backpackers and foreignness. This place has lots of street food, bars, cheap shopping and tour options. Since we had covered everything in Bangkok that day there was practically nothing else to do here. So we decided to go for Ayuthaya, around 80kms from Bangkok city the next day. Please note that we wanted to explore the cultural history of Bangkok only and we did not have any interest on the glass shopping malls in the city which is also famous with tourists from India. Ayuthaya is the old capital of Thailand and this place is alluring with the pictures we have seen in the magazines and internet. 19th January 2014: We started around 10am for Ayuthaya from the hotel. The total trip for the day cost us ~2000 Bhat on a taxi. Ayuthaya gets it name from Ayodhya in India which is capital of Rama. All kings of Thailand are named after Rama. So the capital is Thai version of the Ayodhya. The place is actually a inland island surrounded by rivers on all side. We explored the island at leisure. We returned to Bangkok at 6:30 PM. We asked the taxi to come back after an hour so that we can get refreshed for the trip back home. We caught our return flight and reached Kolkata airport at round 12:30am. 20th January 2014: Back to home.